Sure to become their favorite for morning coffee, this sweet ceramic design brims with lush red roses, pink alstroemeria and miniature red and yellow carnations. It's a great way to send your love! Yellow and Red Miniature Carnations. Standard Arrangement Measures 12" x 12". Happy You're Mine Bouquet is a hand delivered gift. These gifts are delivered by one of our local design centers located throughout the United States and Canada. Same day delivery is available for most gifts when ordered before the cutoff time. The cutoff time for Happy You're Mine Bouquet is in the recipient's time zone. 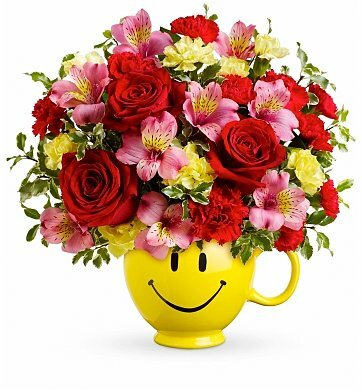 A collectible happy face mug filled with fresh blossoms is just the thing to bring your sweetheart a smile. I sent this gift to my Dad to surprise him for his birthday. I originally sent it to the wrong address, but it was very easy to get in contact with a representative to correct. They did a great job and the bouquet was stunning. Oh and I did this all in the same day. I send to family and friends. The flowers last longer and look exactly as they are pictured or better. Nice for a change to receive what I ordered and always on time!! Last minute order. It was delivered on time. Reasonable price.